A horrible day to own speculative growth stocks as the IBD50 is getting crushed, down over 3%. RAX ‘s 12% haircut looks modest in comparison to FOSL’s horrifying 37% plunge! 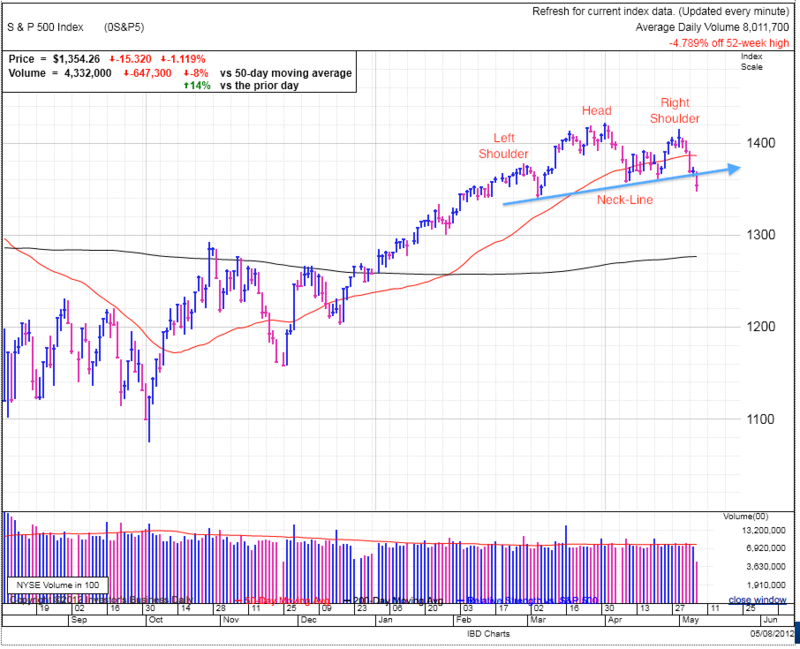 European political discord has pushed the broad markets under previous support and broken the neckline of a head and shoulders, a common reversal pattern. Given negative headlines/fundamentals and now technicals, the bulls have little to hang their hat on as the pendulum is swinging solidly into the bear camp. It is periods like this that challenge the home-run hitter’s resolve as they try to stomach these precipitous sell-offs in their core positions. These are the times when following your portfolio daily can be a hindrance to a buy-and-hold investor’s performance because moves like these tempt them to sell at the wrong time due to emotional weakness. The only way to make good money in this game is to sell on the way up or hold through the pullbacks. Getting shaken out during normal pullbacks is the exact wrong thing to do and is what prevents most amateurs traders from capturing worthwhile profit from their good ideas. No doubt the market could go either way, but it sure feels like this move has more room on the downside as the market demoralizes the buy-the-dip crowd and former bulls turn tail and run for cover. Often dips make for great entry points, but this doesn’t feel like the time or place for that kind of contrarian thinking. The best short-term trade continues to be moving to cash or for the bold, shorting. Of course for the home-run hitter, my longer-term prognosis is for this weakness to pass and the market to resume higher in the second half of the year. But for my nerves and account balance, I’d rather sit out the decline and wait for the rally to get back in.